Dan Goben Cars is easy to find! 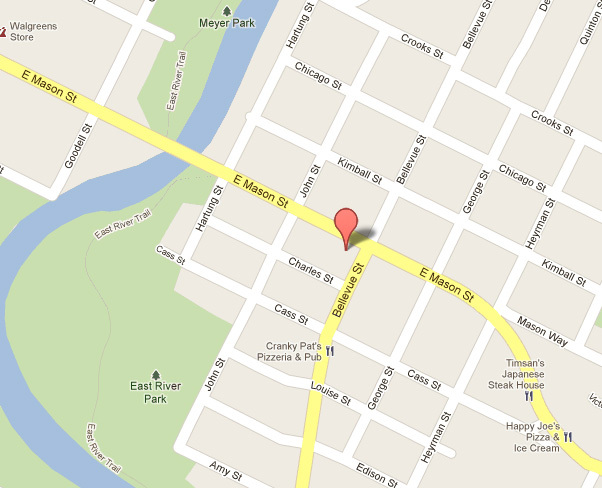 We're centrally located on East Mason St and Bellevue St. Stop by today! Click here for a map. Head south on US-41, take exit 171 towards Milwaukee and merge onto I42. Take the Webster Ave/E Shore Dr exit #187 and turn right on Webster. Go 1.8 miles on Webster and turn left on E Mason St. Dan Goben Cars is on the right one mile down on E Mason and Bellevue St.
Head North on US-41, take exit 163B for Ashland Ave and continue straight on Ashland Ave for approximately 5 miles (continue straight through the round about on Ashland Ave). Turn right on Mason St (WI-54 E) and continue for another 2 miles. Dan Goben Cars is on the right on the corner of Bellevue and E Mason. Take WI-57 South. Follow the signs for I-43 towards Milwaukee and merge onto I-43. After 2.7 miles take exit 183 for County Road V/Mason St. Go right on Mason St at the end of the exit ramp. Continue for 2.7 miles Dan Goben Cars is on the left on the corner of Bellevue and E Mason. Head North on I-43. Take exit 178 and merge onto US-141 N/County Rd MM/Elm View Rd toward WI-29. Turn left to stay on US-141 N/County Rd MM/Elm View Rd and go 2.7 miles (continue straight on the round about to Main St). Turn left on Mason St and continue for one more mile. Dan Goben Cars is on the left on the corner of Bellevue and E Mason. Exit the mall parking lot and and turn left on Mason St. Continue for approximately 1.5 miles. Dan Goben Cars is on the left on the corner of Bellevue and E Mason. Exit the mall parking lot and turn right on Main St. Take a left on Mason St and continue for one mile. Dan Goben Cars is on the left on the corner of Bellevue and E Mason.